Content can help spread brand recognition; attract new customers; and increase your SERP. When creating content make sure to make it is informative, for both existing and new customers, it is reader friendly, and keyword optimised so you can achieve all these goals at once. Evergreen content is a term that describes content that will never fall out of fashion. Evergreen content can be static content or repurposed time and again for new takes on your business. While content that focuses on trends can be great for a short term boost, content that goes the distance has a higher ROI. When you publish content, whether it is a blog, a video, or an infographic, make sure to host and share it on a variety of platforms. By sharing the same piece on multiple platforms, can help increase engagement and shares. Analytics will tell you what customers are interested in, find new opportunities for engagement and growth, and increase your sales potential. Analytics track and analyse customer information and create useful pieces of information that you can put into action when developing your content (TenFold). The best way to get the most ROI out of your content is to hire a content management expert. Content management experts, like the professionals at ALHAUS, know exactly what content will get a high return on your investment. They remove all the guesswork and develop your content strategy to ensure that you always have a high ROI. 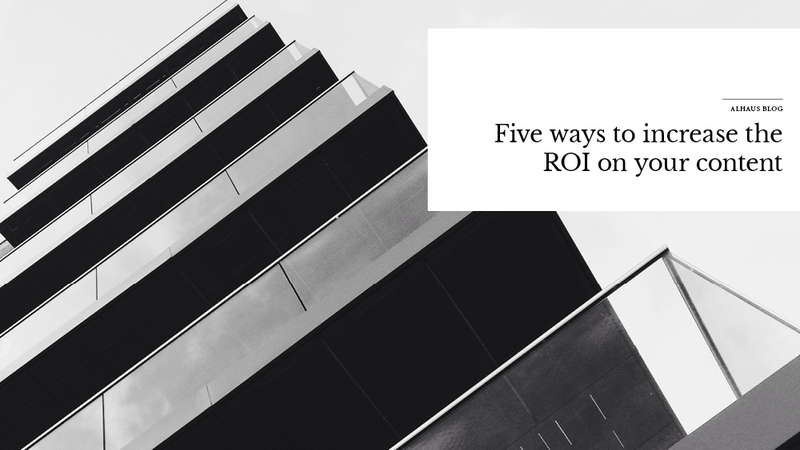 Following these five tips will help ensure that you get the most return out of all of your content creation efforts. For more tips and guidance, reach out to the experts at ALHAUS. We have helped both large and small companies get a high ROI out of their content. Contact us today to learn more.